The decision to split the finale of The Hunger Games series into two parts leaves fans with little choice but to queue up for the penultimate offering, even if it’s a bit of a placeholder. In general, I’ve found the series to be reasonably good, an entertaining addition to the world of big-screen YA fiction that spills over to a broader audience. Two previous movies have reinforced the notion that the story’s main character — Katniss Everdeen — is indefatigable, rebellious and self-sacrificing. Fair to say, too, that the gifted Jennifer Lawrence has made Katniss her own. At times, she even looks younger than her 24 years. Lawrence, of course, returns for The Hunger Games: Mockingjay — Part 1, a movie that takes a step toward concluding the whole business, though not a giant one. The movie feels like an obligatory — and somewhat listless — march toward the real finale, due next year. Director Francis Lawrence (I Am Legend) takes two hours to deliver a slightly unbalanced result: His film manages to be darker and more complex than its predecessors — a look at issues involving propaganda and war — but it’s also less exciting. Part 1 deposits us in a post-games world in which the ruling Capitol is being threatened by rebels and in which many of the districts of the great empire have been reduced to rubble. The high-stakes drama that the games themselves imposed on previous movies has gone missing. Although severely traumatized from the last episode, Katniss is asked to emerge again as Mockingjay, a much-admired warrior. She’s supposed to provide inspiration for weary revolutionaries who are prone to intimidation by the imperious and markedly evil President Snow, played by Donald Sutherland with all the soft-spoken, sinister intent he can muster. Burdened by doubt, Katniss is distraught that her friend and love interest (Josh Hutcherson’s Peeta) is being held prisoner in The Capitol. Worse yet, Peeta allows himself to be used. He’s making TV spots encouraging the rebels to seek peace; i.e., to submit to the Capitol’s exploitative authority. The supporting cast is minimized in this episode. 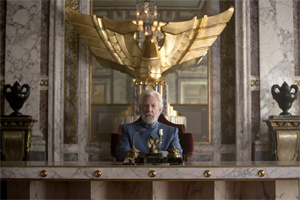 Philip Seymour Hoffman’s Plutarch Heavensbee devises an ad campaign to boost rebel morale, and Julianne Moore’s President Alma Coin makes stern speeches to the populace of District 13, an underground redoubt where even the Capitol’s bombs are ineffective. As Haymitch Abernathy, a briefly seen Woody Harrelson seems to show up between other jobs. Even Elizabeth Banks’ lively and pretentious Effie Trinket seems subdued in this most despairing of all the Hunger Games movies. Liam Hemsworth’s Gale is around to advance the plot. Although Part 1 ends in anguish, it spends too much time allowing Katniss to wander across the dystopian wreckage in this final chapter of author Suzanne Collins’ much-read trilogy. Katniss isn’t even a prime mover in the movie’s last bit of action. I wouldn’t say that Part 1 has done irrevocable damage to the franchise, but it doesn’t really satisfy. Like exhausted baseball fans, we’re left to console ourselves with a familiar refrain: Wait until next year.